This is similar to the styles shown in the previous posts, except the plaits were bigger the last time. I made them smaller this time around as I want them to last for about two weeks. 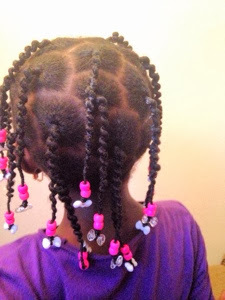 She wanted beads so I used a few on each plait so the beads would not weigh down and put stress on her ends . The smaller the plaits in size, the fewer the beads that should be used . 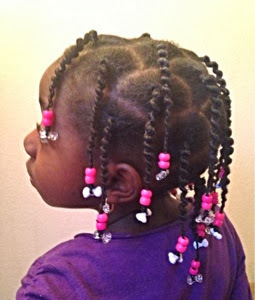 Her hair was very well-moisturized and sealed with the LOC method. 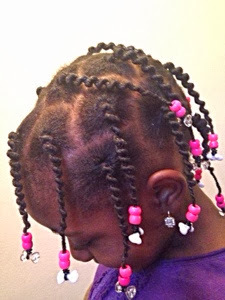 This method keeps her hair moisturized for a week. However, because her edges are growing in fast (I think the Nubian Heritage masque and castor oil are working), they have to be moisturized and sealed every two days to keep the hair around her edges from locking.